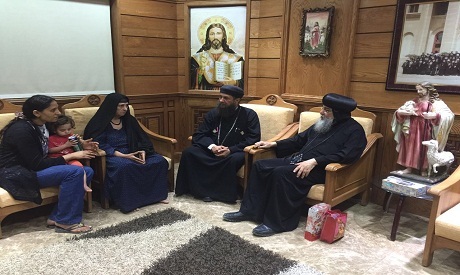 The Coptic Orthodox Coptic Church said in a statement on Wednesday that a mob attacked Christian homes in a village in Minya last Friday, and stripped an older Christian woman of her clothes during the assault. "A group of 300 people carrying various types of weapons went at 8pm on 20 May to attack seven houses owned by Christians, burgling some of them and torching others," said the statement, estimating the financial losses at EGP 350,000. "The attackers also stripped an old Christian woman of her clothes in front of a huge crowd in the street," read the statement, which was issued by the diocese of Minya and Abu Qirqas. The sectarian attack in the village of El-Karm followed a rumour that a Muslim woman and a Christian man were involved in an affair, according to the statement. The woman attacked and stripped naked was the accused man's mother, the statement added. The incident was first reported on social media and by activists several days ago. The Christian man who was the subject of the rumours has been forced to leave the village after receiving threats. "His parents already filed a complaint at Abu Qirqas police station about receiving threats on 19 May and that they expected those threats to happen the next day," read the church's statement, adding that the man's family had reported the incident to the authorities. According to the church, security forces reached the area at 10pm on Thursday, arresting six people who are under investigation. "We trust that such behaviour is not accepted by any respectable person; we also trust that the state apparatuses won't stand by as a spectator and thus we thank in advance the security apparatuses as we believe it will all arrest all those involved and hold them accountable," read the church's statement. The governor of Minya, Tarek Nasr, however, denied in a TV interview with anchor Ahmed Moussa on Sada El-Balad Wednesday night that the woman was stripped naked, describing the whole incident as a "regular" fight. Nasr also blamed the Muslim Brotherhood for “exploiting” the incident and spreading rumours. The governor confirmed that the sectarian tension in the village was caused by a rumour about a Christian man having an affair with a Muslim woman, adding that questions of love affairs and honour in Upper Egypt are usually "sensitive" issues. "Some irrational youth threw flammable missiles at the houses of Christians in the village and some women ran away in their nightgowns," Nasser said denying that an a older was stripped naked and insisting that the matter has been resolved. Similar sectarian-motivated attacks on Christians have taken place in Minya and other parts of Egypt in the past several years. Social media users demanded legal action from the authorities, criticising the government's reliance on customary conflict resolution and reconciliation assemblies which are regularly held by religious and community leaders to resolve sectarian tensions among Muslims and Christians in an extra-legal manner in Egyptian villages. These sessions have often been criticised by both Muslims and Christians for being an inadequate, informal means of resolving conflicts that require government intervention. In a democratic country, elsewhere, this governor should be fired for telling outright lies to the public about the woman incident. Also, the sensitive (rather bloody) issue of love affairs he casually mentions is repeated systematically where, in some single incidents, EACH, tens of houses and businesses are torched overnight and Christians murdered (times more than Muslims if any). Yet the State just reconciles the victim with the culprit, or worse RELOCATES the Christians elsewhere, which is against international law. Meanwhile, when the claimed affairs concern Christian (not Muslim) women, they are easily kidnapped, videotaped, converted, and married to their kidnapper, all under the the state's eye. Like before, the state still dangerously uses fanatics to its own advantage like a puppet it holds with one hand and frees with the other: to alienate/smother the public, while killing terrorists elsewhere, but never FACING fanaticism (in textbooks, sermons, TV & state authorities). The story should read a group of Egyptians assaulted an Egyptian woman. The law should be applied accordingly. An Egyptian woman was assaulted and stripped naked. That is the crime - period. It make no difference what rumor the mob heard, they had no right to assault an Egyptian woman, The behavior is criminal and inexcusable.